As the owner of a pair of roller-blades, I can confidently say that there is nothing less cool than roller-blades. I am still conflicted about my own. Many years ago (back in the U.S.), I used to wear them around my neighborhood while kind of pretending I wasn't wearing them. Oh these? They're just my shoes. I could never reconcile my desire to roller-blade with the self-loathing that it inspired. 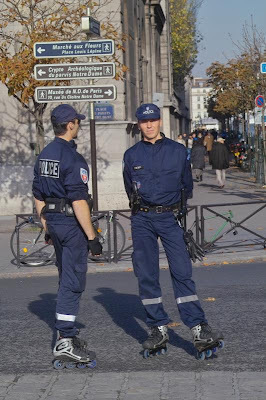 Parisians are not conflicted on this front. When it comes to their status as bladers, ils l'assument. They own it. It amuses me that a demographic that is generally so put together can throw all that style to the wind when it comes to roller-blading. MC hammer pants (preferably denim)? Check. Whatever shirt I happen to be wearing (even if it's a blazer)? Check. Perhaps some type of strange head garb? Check. Now that spring is here, those who spent all winter long looking totally normal (walking, can you imagine?) have been reborn in all of their bladed glory. It's like monarchs emerging from cocoons.... no, it's like phoenixes rising from the ashes. And it is a sight to behold. All this roller-madness reminds me of an encounter I had last fall. I was walking down the Rue de Rivoli and found myself crossing a few intersections at the same time as a roller-blader. Eventually he sped off, but then circled back and asked me if I wanted to have a coffee. "Not with those things on your feet," I thought. 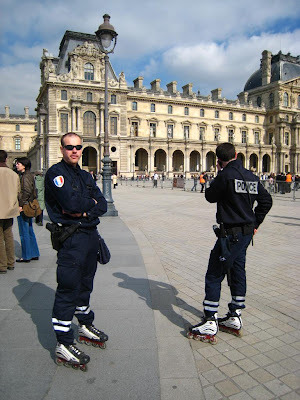 Foolishly, I didn't know then that roller-blades were the height of Parisian style. Live and learn. Be aware of your surroundings and nearby moving vehicles. Wear brightly-colored clothes or reflectors to increase visibility.